Mackenzie’s (Ella Purnell) struggling mother sends her to Alaska to her uncle (Brian Geraghty) to look after her while she sorts out her own problem. At first the hospitality of her uncle makes her feel really comfortable until the moment when he starts seeing her not just like a niece but a young and attractive young lady. 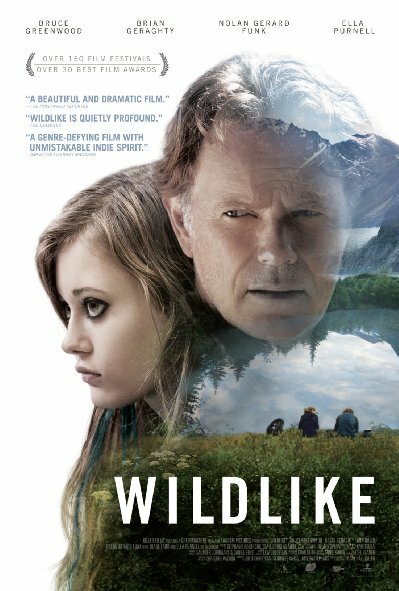 Being fearful and desperate, Mackenzie runs away from her uncle when she finds someone named Rene Bartlette (Bruce Greenwood) who, unlike her uncle, shows what does it mean being caring and supportive…. When Wildlike begins, we find Mackenzie at the airport on her way to Alaska. We find out that her mother has her own problem and she can’t look after her, a troubled teenage girl. Our heroine arrives in Alaska and meets her uncle. She finds him as a supportive caretaker and friend. But one night, her uncle comes into her bedroom breaking all the trust she had in him. Forced to run, Mackenzie tries to make her way back to Seattle alone to find her mother, but instead winds up deeper in the Alaskan interior. But soon her faith in people will be tested again when she meets Rene, a man with his own problems. Together, they must not only cross the wilderness but also find peace and solve their inner problems that’s eating them from inside. Film written and directed by Frank Hall Green opens up an interesting journey for the viewer to see how trusted relationships can be broken in a moment but gained with someone else, again, within a short time. Instead of taking Mackenzie into wilderness alone, Green sends the teenage girl to face another challenge in the face of Rene Barlette, who seemingly tries to help her to get through her problems. But how much can a fourteen year old girl know about trust, when her relative has already ruined it? Bruce Greenwood’s Rene appears very trustworthy person right from the beginning, making Mackenzie believe in the same. Ella Purnell as Mackenzie is believable, interesting and vulnerable, but meantime, strong young girl who is not afraid to go against her own fears. Frank Hall Green as a writer and director certainly does a great job earning the viewer’s trust from the beginning where you already know this is not going to be a simple story to follow. He clearly indicates the two sides of man that can be good and bad, but he leaves it as a great challenge for the teenage girl to decide, to read and identify who she can trust in order to not get disappointment for the rest of her life.